What are the outcomes they are trying to achieve? What is the most likely alternative we are competing against? What is important to the business and the people we are selling to? We explored this topic in detail in the first blog in this series. 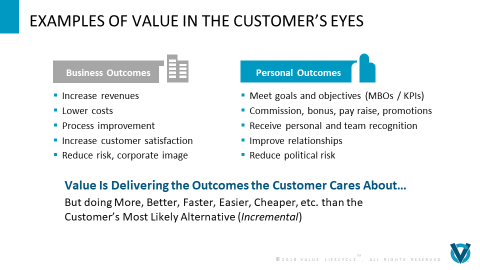 As we discussed, customers pay for our products and services, but they buy different (and hopefully better) outcomes. Value is simply an impact of achieving those outcomes. Let’s assume the desired outcome is to reduce time to market. Then the value associated with that outcome may be increased market share, increased revenues, etc. associated with a reduced time to market. What’s the most likely Alternative? 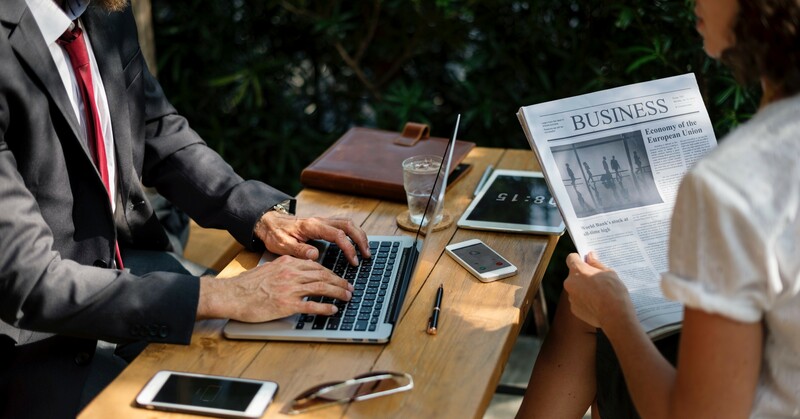 We learned in the previous blog that customers have three theoretical Alternatives to if they don’t do a deal with us: 1) Go with a competitor; 2) Do nothing; and 3) Do it themselves. Once we determine which alternative we are really competing against, our value is incremental to that alternative. In other words, what incremental impacts will our offering deliver? This is perhaps the most difficult and yet important concept to grasp when it comes to value. Value is anywhere and everywhere relative and incremental. Our value will therefore be delivering the desired outcomes important to the customer but delivering more, better, faster, cheaper, easier, etc. than the most likely alternative. Important to the Business and the People? There are outcomes and impacts important to the business such as increased market share, reduced costs, increased revenues, etc. as we discussed above. But the decisions are not being made by a “business”, rather they are being made by people in that business. Therefore, our value must also be relevant to and recognized by these key decision makers. Perhaps by achieving the outcome of increased market share they will receive a bonus or promotion or special recognition. Again, our value to these key decision makers is whether we can we help them achieve those personal results faster, easier and with less risk that the most likely alternative? The figure below gives examples of business and personal value in B2B sales. Now that we have a grasp of what value is, in the next blog in this series we will pull together the first four sales management questions and turn them into the definitive output of selling and that is an Irresistible Value Proposition – one that will cause the customer to sit up, take notice, want what we’re selling and want it right now!